The most interesting part is the picture on the invitations which is generating all sorts of speculations in the media about what the event might bring. 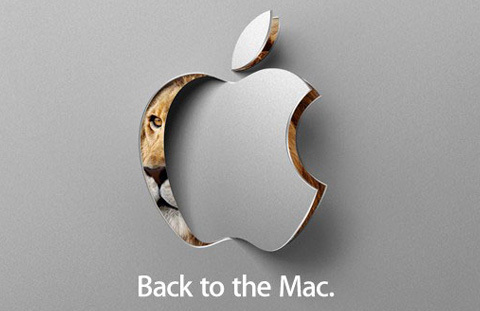 The photo is an Apple logo cut out on a sheet of metal which is slightly turned to reveal what’s behind: a Lion. This obviously means that Apple is all set to launch the next version of its Mac OS X as Apple always names the Mac OS after big cats. Here are the previous names of the Mac OS X versions to date. The new version could very well be called ‘Lion’ as that’s what the picture shows behind the Apple logo on the event invitations. As far as the changes and new features are concerned, there has been a lot of talk and leaked reports in the media in the last couple of months about the new Macs. The most discussed news is still about a convertible device that will switch to iOS with touch screen technology from OS X when tilted backwards. There are also a lot of expectations regarding upgraded processors (core i3) and NVIDIA Optimus finally making an appearance on Mac but nothing is confirmed yet. It is also expected that Apple might surprise the audience with the next generation iPad, although there’s no mention of it in the statement on the invitations. Speculation will of course continue to grow as the date comes nearer but fans will have to wait for the actual day to finally find out what Apple has in store for them next.